Appearing all black against the light, the male indigo bunting properly lit is an unforgettable sight. A persistent late-season singer, he sings a jingly song comprised of paired notes that are often described as: Fire! Fire! Where! Where! Here! Here! Put it out! Put it out! Much of what we know about celestial navigation in songbirds derives from work with captive buntings at the Cornell Lab of Ornithology, but you don't have travel far from downtown Chicago to see the Indigo. Just 45 minutes southeast to the country of Valparaiso, IN home of Valparaiso University. The male indigo bunting is so breathtaking with its tropical blue and silvery bill. The females and immatures are a warm cocoa brown overall. This bunting has a habit of twitching its tail to the side, and its spit note is characteristic. Males change their blue feathers for brown in autumn, which makes for some interestingly mottled specimens. They molt again on the wintering grounds in Central and northern South America and return in spring, blue once more. This species is common on roadsides and disturbed areas there "trashy" vegetation flourishes. Power lines cuts, old fields, landfills, railroads, and hedgerows ring with the songs of indigo buntings, especially as summer reaches its fullest. That is where you will find them right here at Songbird Prairie Bed and Breakfast. 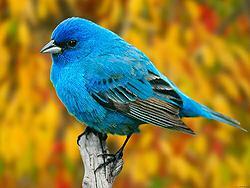 The indigo bunting takes insects when they are available, especially to feed its nestlings. Weed seeds are its mainstay, and thistle from the feeders, supplemented by berries and small fruits. It forages on or near the ground, as well as in low shrubs and trees. Watch for them in autumn, bending grass stems and flickering their tails side to side as they forage in weedy patches here at Songbird Prairie Bed and Breakfast. Indigo buntings have a rather loose definition of monogamy, with extra pair copulations being frequent. Males visit females in neighboring territories, and females visit males. Males vary in their tendency to feed young. Some are attentive parents where as other leave most of the chick rearing to their mates. The nest is bulky but compact, cup-shaped and constructed of bark strips, grasses and weed stems and skeletonized leaves, all bound with spider webs. It's often low in blackberry, sumac or other brushy vegetation. These birds nest quite late in the season, reflecting their dependence on late maturing weed seeds. Three to four eggs are incubated by the female for about 12 days, and the young leave the nest 8-14 days later. Early in the spring you may see them feasting on dandelion seeds. Later, black oil sunflower seeds and millet mixed prove attractive. They love coneflower, Mexican hat, cosmos, coreopsis and especially foxtail grasses. Come and enjoy the beauty of the indigo bunting here at Songbird Prairie Bed and Breakfast.